Cucullia luna Morrison, 1875, Proc. Boston Soc. Nat. Hist., 18:122. Nycterophaeta magdalena Hulst, 1882 [February], Bull. Brooklyn Ent. Soc., 4:45. Epinyctis notatella Grote, 1882 [April], Canad. Ent., 14:75. 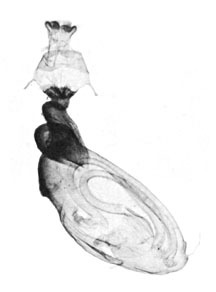 Diagnosis: How such a pretty and distinctive species could have been described three times in three different genera is a mystery. 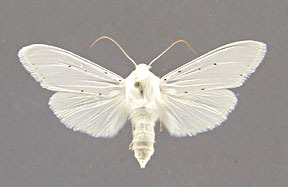 The silvery white color and elongate forewings will immediately distinguish luna from any other North American noctuid. 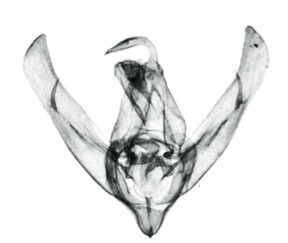 This species has served as the type of two generic names, both based on the presence of a foretibial claw projecting into points both anteriorly and posteriorly. 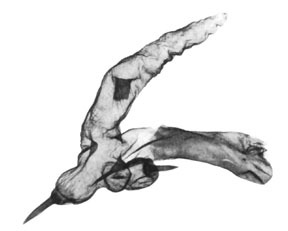 Wing length from base to apex: mean = 20.40 mm., standard deviation = 0.75 mm., n = 10. Distribution: This species is found primarily in the northern plains states of the United States and the prairie provinces of Canada. It is moderately common in North and South Dakota, Montana, Wyoming, south into Colorado, Nebraska, and as far west as central Utah. It occurs as far south as Navajo County in northeastern Arizona. 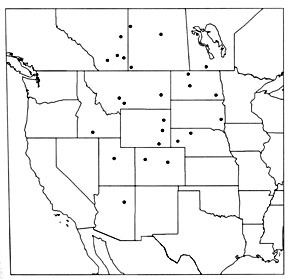 The collecting localities I am familiar with are all located in grassland of one sort or another. Adults have been collected in June and July.